To support you in your food-loving nourishing needs, I've brought together all of my favorite clean eating resources. Nourishing ourselves with food is about so much more than the nutrients we consume — although the nourishment our body receives is crucial for our well-being and for a happy, healthy nervous system. But the nourishment doesn't stop there. Spending time in the kitchen and at the table can be an opportunity to connect with others, from your significant other to a posse of friends. Plus, spending time slicing and dicing can offer you a unique opportunity to move about and entice your senses (movement is also crucial for a healthy nervous system). Clean Foods prepared and delivered to you. These prepared foods are ideal for those times when you're in the midst of a painful flare or when life is just going to be too busy to prepare foods yourself. They plan, they shop, you cook. For those who eat out frequently, this option can help you to save a bit of money and provide you with a delicious menu. It's a great first step for falling in love with cooking at home! Meal planning and cooking resources. This area is for those who are ready to get cookin'! I share my favorite meal planning app and offer up a ton of resources for stocking your kitchen with tools and clean ingredients. → This page contains affiliate links. Click here to see what that means! There are times when cooking feels impossible. A flare-up of pain, a period of depression, or times when life is simply too busy and overwhelming. These are the times when having one or two of these services bookmarked and ready to go can be crucial to maintaining healthy eating. If you know that there are times of the year when things are harder for you, then mark your calendar to order ahead. 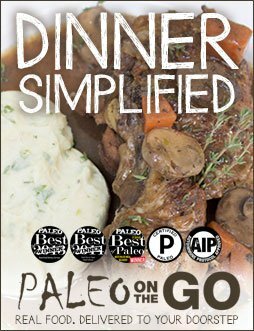 Paleo On The Go offers freshly prepared meals delivered to your doorstep. The meals are prepared without any pesticides. They'll last for six months in the freezer and five days in the refrigerator. To be honest, they're a great option for those times when cooking simply isn't an option. • They offer Paleo Autoimmune Protocol safe meals. • They personally visit the farms they source from. • They prepare everything in-house in their dedicated gluten free commercial kitchen. There are a few Ingredient Delivery programs for healthy meals. What sets Sun Basket apart is their commitment to organic and sustainable food sourcing. It's a great service when you've got a bit of brain fog but still have the energy to cook. I use this app for the bulk of my personal meal planning endeavors! I love that I can import my own recipes or choose from one of their menu options. Plus, I get nifty reminders on preparing ahead and their app makes shopping a breeze. I'll be the first to admit that there is a lot here. But keep in mind that you don't need to buy everything at once. I've added an "*" next to the items that I believe will have the greatest impact on food prep and cooking. Overall, these kitchen tools will make home cooking totally doable, and enjoyable, long-term! *Instant Pot — An electric countertop combination pressure/slow cooker that is the #1 time saver in my kitchen. This nifty pot even has a ferment mode for making yogurt. *NutriBullet — A Vitamix is nice, but a NutriBullet is almost a must. We use, and I recommend, the NutribBullet Rx because you can use it to make the perfect smoothies, homemade nut butters & milks, and soups. One reason I recommend getting a NutriBullet even if you have a Vitamix is the clean-up. The NutriBullet pitchers and cups can go right into the dishwasher. Plus it takes up less counter space. You can purchase a refurbished one for less than $100 on Amazon... and it's totally worth it. Vitamix — A high-quality, high-speed blender that enables us to make large amounts of soups, batters, creams, sauces, smoothies, nut milks, etc. quickly, without worrying about burning out the motor. The Vitamix even has enough oomph to grind nuts, coffee, and more. Juicer — In general, we're an eat whole kinda household. We like our fiber. But, there are times for juicing. In particular, we consume beet juice for healthy blood pressure and young wheat grass for all its glory. The Hurom Elite Slow Juicer is by far my favorite affordable juicer.... and I've been testing juicers out since 1995. *Food Processor — A countertop appliance with multiple blade attachments, designed to help you chop, slice, grate, grind, blend, or mix depending on your needs. This little nugget keeps food prep quick and easy. *Quality Water Purifier — Toxins like microbes, pesticides, plastics, prescription meds, metals, chlorine, fluoride and others are poisoning our water supply. The scary fact is that many of these toxins have been shown to cause cancer, birth defects, cardiovascular effects, reproductive problems and more. Drinking water straight from the tap is no longer an option. Two of my favorite water filters are the Berkey Water Filter, for a no-energy consumption counter-top option (think power outage or no tap water) and the Aquasana under-the-counter filter. Upright Freezer – Personally I prefer the upright freezer over the Freezer Chest as I find it easier to organize and find what I'm looking for. At our house, we hunt & grow, purchase meat and produce from local farms, and buy in bulk when foods are in season. This saves us money and we get to know how the animals are cared for. So additional freezer space is ideal for this as well as for when I batch cook and freeze pre-portioned meals for the humans and four-legged friends in our home. *Immersion Blender – I use this tool weekly for blending soups inside a stockpot, making dressings, and more. Citrus Juicer – Squeezing lemons is a daily occurrence in our household. This tool is great for keeping your hands clean and getting the most out of your fresh fruit. *Sharp Knives – These are non-negotiable in a busy kitchen, both for ease and safety. One or two well-cared-for and high-quality chef’s knives will last you years, save you time and help prevent injury. Serrated Knife — Though a chef's knife is more essential and more versatile, a good serrated knife, a.k.a. bread knife, is hard to substitute: Nothing does a better job of slicing through the soft crumb of fresh bread, or the skin of a ripe tomato, than its saw-toothed blade. Because of that serrated edge, your bread knife will be nearly impossible to sharpen, meaning it'll require replacement every five years or so. Baking Sheets – The workhorses of our kitchens! We use them daily for all our roasting, baking, broiling, and toasting needs, and even for holding and organizing foods before/after cooking. This cast iron variety is safe for the grill. Microplaners – I stock a Microplane Zester for peeling the “zest” or outer flesh from citrus fruits, or for finely grating garlic, turmeric, ginger, or other dense ingredients. But I also keep a Microplane Fine Grater handy for hard cheeses, etc. *Vegetable Peeler – A handheld tool with a slotted metal blade used to remove the outer skin or peel of certain vegetables, often sweet potatoes and carrots. *Glass Containers (Pyrex + Ball) – These are ideal for storing batch cook leftovers because they freeze well, reheat easily and they’re BPA free. *Enameled Cast Iron — The workhorse in our kitchen is the enameled cast iron skillet. You can generally find a couple of them living on the stovetop ready for action all the time. Plus, the Dutch Oven is a wintertime must-have in our home. Something's always a stewin'. They carry the heat well, are great for acidic foods like tomato sauces and clean up in a snap. I'd recommend that you invest in at least one of the enameled cast iron skillets to start with. Cast-Iron Skillets – Economical, versatile, and long-lasting skillets that are naturally nonstick when seasoned correctly. After the enameled cast iron, these are definitely in my top 10 “must have” list. BONUS: They're oven safe! Stainless Skillets – Every home kitchen needs to have a complete set of stainless steel pots and pans with properly fitted lids. Stainless steel provides excellent surfaces that are generally non-stick without the potential toxic leaching and environmental toxin issues of non-stick applications. *Super Salad Spinner — It may look suspiciously like a uni-tasker, but a good salad spinner brings a very particular set of skills to the table. And at our house we use it at least six days a week. A quality one, like the OXO Steel Salad Spinner, makes quick work of drying out herbs and leafy vegetables, without which your salad greens are destined to be a mess every time: wet, limp, unappealing, and sadly resistant to harmonious interaction with their dressing. The two main reasons this item is a must: its interior basket can double as a colander for cold items and that pretty steal bowl can be used to toss your gorgeous greens. *Comfort Kitchen Floor Mat — This is a must have for those who experience discomfort when standing for a period of time. The right floor mat can extend the amount of time you can cook with ease and make the whole experience much more enjoyable. Wood Step Stool — For me, a good step stool in the kitchen is a must! And it isn't just so I can reach the items located high up in the cupboards. I keep the step stool handy for when I'm doing everyday food prep. I like to be able to change the way that I'm standing put one foot up for a bit, or to have the option to sit low. And with the Kings Brand Large step stools with storage have two levels to play with and a place for me to keep my half foam roller tucked away. Half Foam Roller — Why a foam roller in the kitchen? Well, so that I can play with different angles in my ankles, feet, and hips as I prep my foods. This simple addition, along with the step stool, allows me to weave a bit of movement and stretching in to my cooking experience. I've included resources to help you to find local Farmer's Markets, Community Support Agriculture, and more. Organic and local is by far the most nutritious. So please, shop local when you can. Below is a listing of my favorite online and offline resources for finding and sourcing natural, organic, pastured, and toxin-free ingredients for home cooking. This is a short list of local resources. I'm sure there are more stores, and definitely more Farmer's Markets. So please make sure to ask around or use one of the resources above or below to find a market in your area. Honest Weight Food Co-op — Honest Weight is located in Albany, NY. They are one of around 150 cooperatively-owned grocers in the United States, governed through democratic process by our Member-Owners (shareholders who commit an investment of their time to the Co-op on a weekly or monthly basis). Four Seasons Natural Food — Four Seasons Natural Foods is a family owned natural foods grocery store located in downtown Saratoga Springs, New York. Nestled in the foothills of the Adirondacks, the store is owned and operated by Richard Frank, his family and a staff genuinely committed to the service of their patrons. Green Grocer — Green Grocer opened in 1995 with the vision of sharing their love for real sustainable grown foods with the people of New York's capital region. Many things have changed in the last 20 years, but Green Grocer is proud to say that we are still here providing organic produce, vitamins & supplements, and quality health and beauty products. Troy Farmer's Market — The Troy Farmer's Market is home to nearly 100 local farmers and fresh food vendors every Saturday, year-around in downtown Troy, New York. They've been supporting local agribusiness in the Capital Region for 18 years. Capital Region Eat Smart New York — This website contains a list of most of the Capital Region Farmer's Markets and other resources for getting you and your family eating well and moving more. Field Goods —Field Goods is on the forefront of reinventing food distribution. They are like a CSA amplified. Like a CSAs they offer a subscription-based service that delivers produce from small farms to employees and consumers at workplaces and community sites year round. Unlike most local CSA you can join a month-to-month membership vs. a whole season. Plus, you get the benefit of a greater variety of produce simply because they represent multiple farms. And if you use my link, you'll get $10 off your first order. Capital Roots — Capital Roots works to reduce the impact of poor nutrition on public health in New York’s Capital Region by organizing community gardens, providing healthy food access, offering nutritional and horticultural education for all ages and coordinating urban greening programs in Albany, Rensselaer, Schenectady and southern Saratoga Counties. I am a BIG fan of shopping local. So below I'm offering a few resources so that you can find Farmer's Markets, CSAs and more near you. And if you live in the Capital Region of NY, then I'm providing some of my favorite places to shop beyond the local grocery store that's nearest you. Even then, these days you can find a lot of organic and clean products in the grocery store. Just remember to stick to the Dirty Dozen and Clean Fifteen list. Local Harvest — This site is a great resource for finding a CSA (Community Supported Agriculture) near you. What is a CSA? Basically, a farmer offers a certain number of "shares" to the public. Typically the share consists of a box of vegetables, but other farm products may be included. Interested consumers purchase a share (aka a "membership" or a "subscription") and in return receive a box (bag, basket) of seasonal produce each week throughout the farming season. National Farmers Market Directory — Farmer's Markets are a wonderful place to purchase your produce, meats, and more. Often you can talk with the farmers themselves and find out more about the farm. Many farmers farm organically but aren't formally registered due to the cost. Plus, you'll likely discover a local CSA that isn't listed in the Local Harvest directory. Eat Wild – This is a website that contains links and resources for people to find local farms. It is the first place to look if you are interested in buying meat directly from a farmer in your area. Pick Your Own – A resource for finding U-pick farms in your area. Such a wonderful way to connect with your local farmers and to get the freshest of fresh food. Bare Bones Broth – These ethically-produced, chef-designed bone broth can be sipped as a healthy drink or used as a base for soups, sauces and more. So if you're not making your own or want a bit of bone broth back-up, then this is the way to go. If you prefer to shop via Amazon, then I'd recommend the Kettle & Fire Bone Broth. Gelatin + Peptides — The addition of this quality gelatin to our kitchen has been a real blessing. This nutritional additive is a quick way to up the protein in a recipe, a thickener and an excellent way to nourish the skin, hair and nails naturally from within. Plus their Veggie Blend Protein and Beauty Greens are an excellent way to get more veggies and collagen into your day. You can find a ton of snacks and treats in the links above; especially on Thrive, Wild Mountain, and Primal Blueprint. But these two deserve a space of their own. Sweet Apricity Caramels – 100% AIP-compliant caramels that are produced in small batches, hand poured, and hand wrapped in a commercial Paleo kitchen. Dry Farm Wines — I am super excited about Dry Farm Wines! They curate only the highest quality natural wines from small, organic family farms that meet their strict standard of health. Unlike most of today's commercialized and processed wines, this is real wine. Nothing added, nothing removed. All of their wines are organic or biodynamic, contain low sulfites, are gluten free, and Paleo & Keto-friendly! I cannot say enough about how important it is to know where you meat comes from. If you consume animal products from animals that were pumped full of hormones, anti-biotics, or toxic foods then that is what you'll be eating. Know your source! Vital Choice Seafood – Vital Choice is a trusted source for home delivery of the world’s finest wild seafood and organic fare, harvested from healthy, well-managed wild fisheries and farms. US Wellness Meats – These nationwide family farms produce the highest quality grass-fed and pasture-raised meats and other products in the country. Shop online and have them delivered, or search their online retail directory.